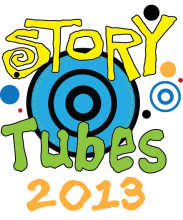 I’m going to be a judge for next year’s StoryTubes contest! This is a national kids book trailer contest and all libraries are invited to participate. Promo materials are available here if you want to get your kids involved. Kids have to be between age 5 and 18. Entries must be submitted between 10:00 a.m. EST on January 18, 2013 and 7:00 p.m. PST on February 24, 2013. What is StoryTubes? The 2-minute or less “my favorite book” video project is a unique opportunity for kids to promote their favorite books via short videos…and for kids to learn about new titles by watching them. While the program does include a contest component, with prizes donated by national publishers and others, the goal of the program is to harness kids’ excitement for books and share it on the Internet. Posted on November 27, 2012, in Literacy. Bookmark the permalink. Leave a comment.